Goodreads Summary: It's been several generations since a genetic experiment gone wrong caused the Reduction, decimating humanity and giving rise to a Luddite nobility who outlawed most technology. Inspired by Jane Austen's "Persuasion", "For Darkness Shows the Stars" is a breathtaking romance about opening your mind to the future and your heart to the one person you know can break it. When I saw that this book was based on Jane Austen's Persuasion, I knew that I had to read it. I love all things Jane Austen, and I was excited to read a story that was inspired by Austen's work rather than just another spinoff from it. Besides, any book with a cover this gorgeous just has to be read. Elliot North is a Luddite, and as such is a member of the highest class. After the death of her mother, she takes over the responsibilities of managing the North estate, overseeing the Post-Reductionists and the Reduced. When her childhood sweetheart Kai, a Post, asks her to run away with him, she knows that she must stay on her family's estate. She never expected to see Kai return as a free Post with the Cloud Fleet and to spend time living on her grandfather's estate. Elliot is hopeful that they can rekindle their friendship, but it seems as though Kai wants nothing to do with her. However, Kai might have deeper reasons for avoiding her than simply harboring an old grudge. And when Elliot learns them, how will it make her see the only boy she ever loved? For Darkness Shows the Stars was inspired by Persuasion, and if you've read that book, you can follow the story trajectory through this one. However, if you haven't read Persuasion, or if you don't want to reread it, never fear - Diana Peterfreund makes this into its own wonderful story. Although the book started out a bit slowly, once it picked up it became impossible to put the book down. In addition, though this book is science fiction, it is not overly scientific. At its heart, it is still a love story. One of my favorite things about this book was the inclusion of all the childhood letters that Elliot and Kai wrote to each other. I loved seeing that relationship develop as they grew up. Once Kai had come back, emotions were definitely charged. My heart went out to Elliot for what she'd had to do in the past and what she suffered during this book because of it. I also loved how vivid everything in this book was. From the contraptions that the Cloud Fleet invented, to the North estate, to the emotions, I could see and feel everything. I felt that I knew even the minor characters, like Ro, and I enjoyed getting to know them all. Also, if you have read Persuasion, you know that there is one incredibly romantic scene, and I loved seeing its counterpart in this book. I believe there is the possibility of a sequel, and I am certainly hoping for that, because I would love to see more of these characters and this world. 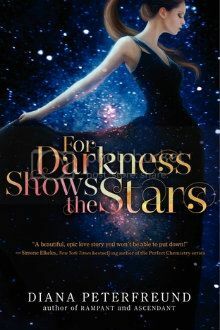 For Darkness Shows the Stars is a book that you do not want to miss!